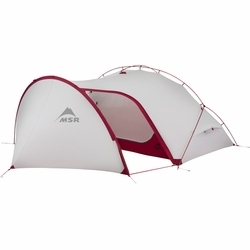 MSR Hubba Tour 2 Tent. Two-person, full-protection adventure touring tent. The Hubba Tour 2 redefines the art of long-term roughing it. Designed with added space, protection and livability for two people on self-supported adventure tours, this tent makes life on backroads easier to sustain, day after day. From its exoskeleton design that helps the interior stay dry during setup, to its ultra-durable Xtreme Shield™ coating that helps keep out the wet, this tent handles the weather with comfort to spare. The large vestibule offers a convenient transition zone from outside to inside as well as a protected space for gear, while a second large door gives direct access to the main tent. Unique Design: Exoskeleton frame and unified rainfly and body keep the tent body dry during setup in foul weather. Added Space: Large hooped vestibule provides a dry, protected area for changing clothes, lounging, and storing and prepping gear. Livable Features: Two easy-access entrances, multiple gear storage solutions, and an internal glow-in-the-dark zipper. Xtreme Shield™ Coating: Ultra-durable coating lasts up to 3 times longer than standard waterproof coatings.